Qatar Airways will celebrate Chinese New Year, one of the most important annual events in the Chinese calendar, by serving Spring Festival-inspired dishes on flights to popular Asia destinations as well as in the airline’s premium-class lounges. On Saturday, Jan. 28, First Class passengers flying to and from Guangzhou onboard Qatar Airways’ A380, and Business Class passengers travelling to and from Hong Kong, Singapore, Beijing, Shanghai, Chongqing and Chengdu can select from an à la carte menu that will feature Cantonese style roasted chicken, sautéed Asian vegetables and steamed jasmine rice with black sesame seed, and grilled prawn with stir-fried noodles and Jiangxi-style sauce. Dessert offerings include tofu cheesecake with a sesame tuile and mango coulis, and Mandarin orange and chocolate torte with raspberry coulis. Guests travelling in Economy Class can select roasted chicken with sesame hoisin sauce, steamed jasmine rice and sautéed vegetables followed by Chinese tea cheesecake or Mandarin orange and vanilla torte. 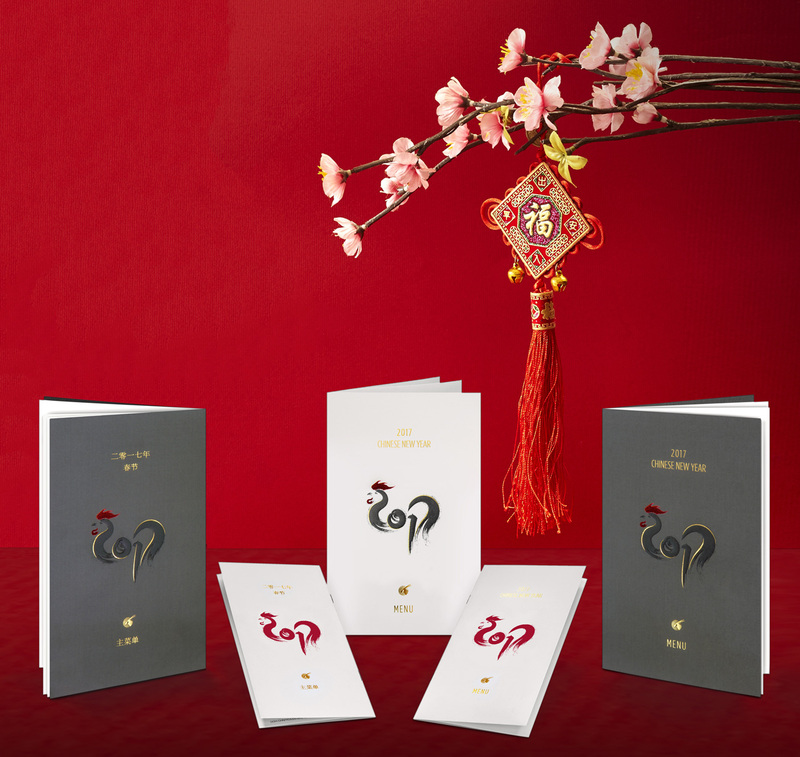 Travelers on select flights will also receive a customary red envelope gift on their flight to Doha containing chocolate gold coins that celebrate the spirit of good fortune and prosperity that is symbolic throughout Chinese New Year festivities, the airline said. Qatar Airways’ premium-class guests travelling via Hamad International Airport will also have the opportunity to sample an exclusive feast in the Al Safwa First Class Lounge and the Al Mourjan Business Lounge. First-class passengers will be able to sample Chinese New Year dishes representing good wealth and fortune, created upon request by Al Safwa’s in-house chef. Those dishes include Peking duck and pan-fried Chinese pancakes accompanied by bok choy, scallions, cucumber and pickled radish. Desserts will include a traditional baked red bean coconut cake and a favorite dish of sago and coconut milk, Sai Mai Lo pudding. Business travelers to Al Mourjan lounge can select from a buffet-style menu that will include Peking duck noodle salad, hot and sour chicken soup, yang chow shrimp and egg fried rice, festive golden five spice chicken, as well as a range of special desserts. While Chinese New Year is Saturday Jan. 28, China's Spring Festival public holiday runs from Jan. 27 to Feb. 2, but Qatar Duty Free and China UnionPay International will be extending the celebration by an additional week. The retailer and the credit card issuer will offer special Chinese New Year promotions to UnionPay cardholders travelling through Hamad International Airport throughout the Spring Festival and until Feb. 9. In addition, a dedicated team of Mandarin-speaking Qatar Duty Free ambassadors wearing traditional Chinese dress will be on hand to answer questions and assist passengers who wish to purchase.